LOS ANGELES, California (CNN) -- A former engineer for Rockwell International and Boeing was convicted Thursday of economic espionage and acting as an agent of China, authorities said. 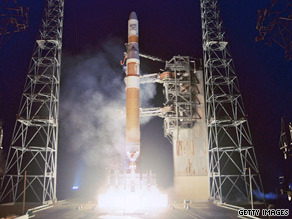 A Delta IV rocket launches on March 10, 2003 at Cape Canaveral, Florida. Dongfan "Greg" Chung, 73, was accused of stealing restricted technology and Boeing trade secrets, including information related to the space shuttle program and the Delta IV rocket. U.S. District Judge Cormac J. Carney convicted him on charges of conspiracy to commit economic espionage; six counts of economic espionage to benefit a foreign country; one count of acting as an agent of the People's Republic of China; and one count of making false statements to the FBI, according to a statement from federal prosecutors. Carney presided over Chung's three-week bench trial last month. In a bench trial, there is no jury and the judge decides whether to convict a defendant after hearing testimony. Chung was free on bond after his arrest by FBI agents and NASA investigators in February 2008. He was taken into custody after Carney's ruling was read. Chung, a native of China who is a naturalized United States citizen, was employed by Rockwell International from 1973 until Boeing acquired its defense and space unit in 1996, and by Boeing thereafter. He retired from Boeing in 2002, but returned as a contractor, a position he held until September 2006, prosecutors said. Chung held a "secret" security clearance, authorities said. "For years, Mr. Chung stole critical trade secrets from Boeing relating to the space shuttle and the Delta IV rocket -- all for the benefit of the government of China," said David Kris, assistant attorney general for national security, in the prosecutors' statement. "Today's verdict should serve as a warning to others willing to compromise America's economic and national security to assist foreign governments." The case against Chung resulted from an investigation into another engineer who obtained information for China. That engineer, Chi Mak, and several of his relatives were convicted of providing defense articles to the PRC, authorities said. Mak was sentenced to more than 24 years in prison last year. According to evidence presented at trial, individuals in the Chinese aviation industry began sending tasks to Chung via letter as early as 1979, federal prosecutors said. Over the years, the letters directed Chung to collect data related to the space shuttle and various military and civilian aircraft. In his letters back to China, Chung referenced materials he had already sent, including 24 manuals relating to the B-1 bomber, which Rockwell had forbidden for distribution outside the company and federal agencies. In addition, between 1985 and 2003, Chung traveled to China several times and met with government officials. His contacts in China discussed these trips in letters and recommended methods of passing information, authorities said. In a 2006 search of Chung's home, FBI and NASA agents found more than 250,000 pages of documents from Boeing, Rockwell and other defense contractors in the house and in its crawl space, prosecutors said. They included "scores of binders containing decades' worth of stress analysis reports, test results and design information for the space shuttle." Each economic espionage charge carries a maximum sentence of 15 years in prison and a $500,000 fine, authorities said. The charge of acting as an agent for a foreign government carries a maximum penalty of 10 years in prison and a $250,000 fine. The charges of conspiracy to commit economic espionage and making false statements to federal investigators each carry a maximum sentence of five years in prison and a $250,000 fine. Chung is set for sentencing November 9.